A woman lights a candle in front of a portrait of Russian Ambassador to Turkey Andrei Karlov outside the Foreign Ministry headquarters in Moscow, Dec. 20, 2016. Countries unite in shock and disgust at killing of Andrei Karlov. The murder of Russia’s Ambassador to Turkey Andrei Karlov on Dec. 19 in Ankara has been condemned around the world, with countries in Europe and Asia, Africa and South America issuing condolences. The killing took place during the opening ceremony of a photo exhibition devoted to Russia in the Center for Contemporary Art in Turkey’s capital Ankara on the evening of Dec. 19. Three Turkish nationals were wounded and the attacker – a 22-year-old former police officer – was killed by local security forces. 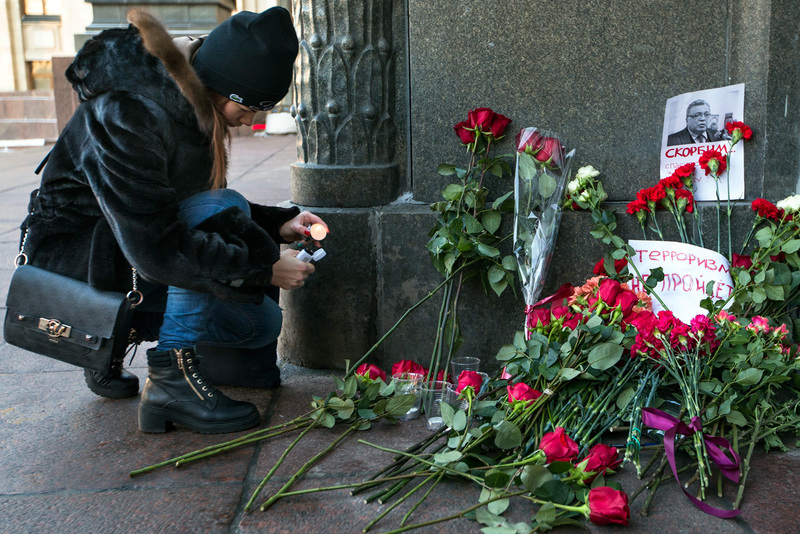 Russia’s Foreign Ministry said the assassination of the ambassador was an act of terrorism. U.S. President-elect Donald Trump condemned the assassination of Karlov, saying in a statement that the attack had been carried out by a "radical Islamic terrorist" and violated "all rules of civilized order." In Syria, the SANA news agency said on Dec. 19, that the government resolutely condemned the assassination of the Russian diplomat, citing the Syrian foreign ministry. Iraq also expressed deep condolences and sympathy with the Russian people and authorities. "The Foreign Ministry of Iraq decisively condemns the murder of Russian Ambassador Andrei Karlov in Ankara," the ministry’s official spokesman Ahmad Jamal said, according to the Al Sumaria TV channel. Syria and Egypt earlier made similar statements. Peru’s Foreign Ministry called on the international community to "double efforts in the decisive fight against terrorism in all its forms and manifestations." The attack on the ambassador was also condemned in Southeast Asia. "There can be no justifications for such a vile act, especially committed against a diplomat," Singapore’s Foreign Ministry said. "Shocked to hear of despicable murder of Russia’s Ambassador to Turkey. My thoughts are with his family. I condemn this cowardly attack," the diplomat wrote on Twitter. Sweden’s Foreign Minister Margot Wallstrom wrote on her Twitter page that she was "deeply shocked" by the Russian ambassador’s murder. The former foreign minister and ex-prime minister Carl Bildt compared the attack to the murder of Archduke Franz Ferdinand of Austria in Sarajevo in 1914, which sparked World War I. He also voiced concerns that the diplomat’s murder could escalate tensions in the region. Austria’s Foreign Minister Sebastian Kurz called the murder "an awful crime,” while Poland’s Foreign Ministry stressed that such attacks "cannot be justified." The Belgian Foreign Minister, Didier Reynders, denounced the "shocking killing of the Russian ambassador to Turkey" and offered condolences to his family. Spain’s authorities also condemned the murder. "There will never be a place for terrorism in a democratic society," Spain’s Prime Minister Mariano Rajoy wrote on his Twitter page. The Russian diplomat’s assassination stirred up outrage throughout the Balkans, with Bulgarian President Rosen Plevneliev voicing serious concerns over another manifestation of terrorism in neighboring Turkey. Romania’s Foreign Minister Lazar Comanescu said in a message to his Russian counterpart Sergei Lavrov that his country condemns this "disgusting attack against the ambassador."